DFW Food Storage: What Kind of Oil is Best to Store? Answer: We recommend Palm Shortening as the best oil to store. It has an indefinite shelf life! Contains no trans fats! Unlike hydrogenated vegetable oils, (Crisco) this is a non hydrogenated heart healthy oil! 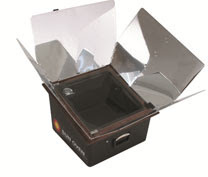 It can be used in recipes that call for butter, shortening, oil, margarine, etc. There was some concern about the way the palm shortening is harvested and I wanted to address to put your nerves at ease. We use Tropical Traditions Palm Shortening Oil. Although scarcely used in the US any longer, palm oil is the most heavily consumed dietary oil in the world after soybean oil. If one were to exclude the US where most of the world’s soybean oil is consumed, palm oil would be the most popular dietary oil in the world. Palm oil traditionally has been used for baking, shortenings, margarines and deep fat frying, as it is shelf stable with a high melting point and does NOT require hydrogenation. Therefore, it contains no trans fatty acids. Saturated fats, such as tropical oils like palm and coconut, as well as butter, have traditionally been considered healthy fats and oils. In modern history, commercial interests have condemned saturated fats and replaced them in the American diet with polyunsaturated fats that are hydrogenised and contain trans fatty acids, which most people now consider harmful. These trans fatty acids were banned in some European countries as early as 2004 and food label laws in the US just forced manufacturers to list trans fats in their products last year. Some cities in the US are now banning trans fats in restaurants as well. 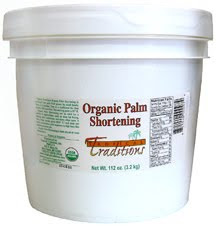 I am excited about having palm shortening as a viable alternative for our food storage program. As a chiropractor and clinical nutritionist I was concerned about the instability of storing vegetable oils as part of our storage program. This gives us a heart healthy stable product that can be stored long term without concern of rotation or it becoming rancid. Hi! Is this 100% Palm? If not, what other ingredients does it contain? Why is it last time I ordered this the bucket in 2011 it came stamped with: "Best if used by 12-28-2012"
They print a "best if used by" date on the palm shortening. This is not to be confuse this with the shelf life of the shortening. The best if used by date refers to the nutritional value of the shortening. All foods have their nutritional value deteriorate over time. So it is with the health benefits of the shortening. However, the palm shortening, when stored properly (cool, dry location) unopened it will store indefinitely, which is why we recommend it for food storage. Opened it will be good for about three years, but hopefully you'll have used it sooner than that. The problem with palm oil is that it is not harvested sustainably. We clear cut and burn the forests and kill all the wildlife including the orangutangs. I read the ingredients on all foods ( it is in a lot) and if it has palm oil I don't buy it. I prefer to not hasten teotwaeki via climatechaos and Thermageddon. I do have a few small jars of sustainably harvested palm oil from the health food store but that's really expensive. Judy, we understand your concern and we do know that is a problem with some. I posted an updated clarification. The Palm Shortening Oil that we use and do group orders with is Tropical Traditions and it is ProForest Ecofriendly family farm.